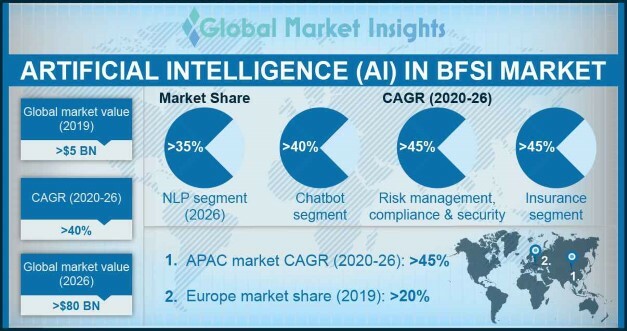 Artificial Intelligence (AI) BFSI Market size is set to exceed USD 25 billion by 2024; according to a new research report by Global Market Insights, Inc. The need to provide an enhanced customer experience is the primary factor augmenting the growth of the AI in BFSI market. As the competition among the market players is mounting day-by-day, companies have started to focus on providing a better experience to the customers to gain the customer loyalty. This encourages financial institutes to integrate advanced analytics tools and solutions to analyze customer data to fulfill their requirement, understand the customer experience, and to make smarter predictions about their behavior and requirements. Furthermore, companies are also looking forward to connecting with the customers on their choice of channels to provide a more seamless experience.